I’ve been really bad about buying jeans in the last year – I only purchased two pairs in 2012 (DL1961 Kate jeans and Current/Elliot boyfriends). I truly need to stock up on some good pairs, and right now I’m on the hunt for some cool white ones in particular. I’m really into the look of distressed jeans but don’t think the boyfriend fit is the best look on me. Do I want an all-white pair or is a hint of black going to be easier to wear year-round? What do you guys think? I think you should go for the all-white. The only thing is all-white pants have a tendency to make your legs look a bit thicker, so you’ll want to try them on rather than order online! Good luck! The MBMJ pair is my favorite! 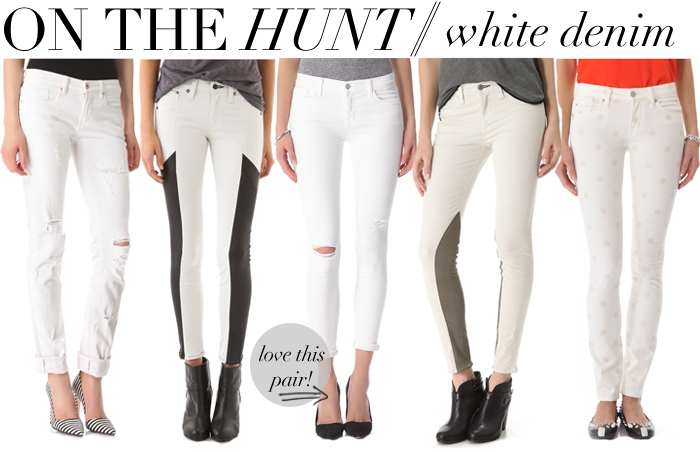 I somehow failed to purchase a pair of white jeans last year, but I am definitely going to pick up a pair this year! aren’t the polka dots to die for?! Me too – I’m so bad about buying pants! you’re so sweet! I love the J Brand’s too – my fave pair! I love those with the polka dots… need a pair of these for sure! Free people has a white pair with a thin leather strip going down both sides that you might like…. They are on my wish list! Ohh I looooove the polka dot pair!! The subtle pattern is so great! I also love Blank Denim… they fit great and are so affordable!